The Dent: More details about the Neil Gaiman tribute album "Where's Neil When You Need Him?" 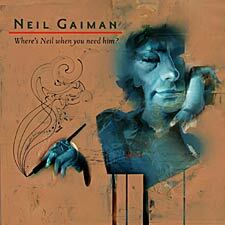 More details about the Neil Gaiman tribute album "Where's Neil When You Need Him?" I reported last month a news story from Billboard.com which stated that an "album inspired by the work of prolific author Neil Gaiman will be released this summer by Philadelphia-based independent label Dancing Ferret Discs. The project, tentatively titled 'Where's Neil When You Need Him?,' is expected to arrive July 18, 2006." Artists who are fans of Neil's work were asked to compose material based on their favorite Gaiman character or story. Tori's contribution to the album is the song Sister Named Desire, which has been remastered for this project. In additional news about this project, Neil Gaiman has posted in his online journal a photo of Dave McKean's cover art for the album, which you can see to the right. You can see it larger if you follow the link to Neil's journal. Also, the album is now featured on the Dancing Ferret Discs website along with the complete track listing to the album. dancing-ferret.com also claims that they will be shipping pre-orders for the album on July 5, 2006, which is 2 weeks before the official July 18, 2006 release date. Thanks to Woj and Nadyne for this information.